During Syracuse University’s Philanthropy Week (http://giving.syr.edu/special-groups/students/philanthropy-week/), three individuals and one group will be recognized with the Orange Circle Award, honoring members of the SU community who have done extraordinary things in the service of others. The awards will be given following the Phanstiel Lecture on Tuesday, April 2, at 4 p.m. at the Sheraton Syracuse University Hotel & Conference Center. Thomas Blumer was introduced to Syracuse University in the early 1980s, while working for Corning Inc. Although he had already earned two degrees from the University of Notre Dame, he enthusiastically pursued his studies at SU and earned an M.B.A. in 1982. During that same period, at the urging of his then-boss, former SU trustee Richard Dulude ’54 (a 2013 recipient of the Orange Circle Award), Blumer joined the advisory board at SU’s College of Engineering and Computer Science. 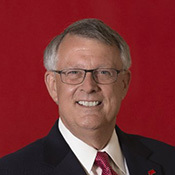 Over the succeeding 21 years, he held leadership positions on the advisory board and was a trusted advisor to the college’s deans, faculty and students. In addition, he and his wife, Barbara, are six-figure donors—and SU parents—who have made provisions for SU with a significant gift from their estates. Now retired from Corning, the former senior vice president remains very involved in his local community. He is a trustee and capital campaign chair at Corning Community College, co-chair of the Chrystal City Park Foundation board of directors and vice chair of Corning’s American Red Cross Chapter. 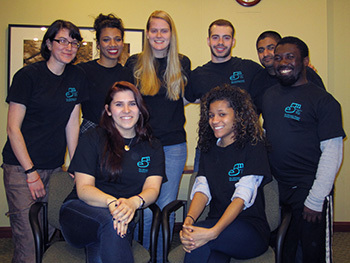 e5m is an interactive advocacy center student volunteer, peer theater troupe. It develops and performs scenarios about sexual assault and relationship violence. The group chose its name in 1992, referencing the then-current statistic that a woman is raped every five minutes. Under the auspices of the Syracuse University Advocacy Center, the troupe’s members—all of whom have attended violence-prevention peer facilitator training—develop and perform skits that are relevant to the lives of SU students, dispel myths about interpersonal violence and increase understanding about the impact such violence has on individuals and communities. The performances lead audiences in conversations about what individuals can do to both prevent violence and support those who have been affected by it. The members of e5m meet weekly to enhance their knowledge and understanding of sexual and relationship violence, develop their acting skills and prepare performances for the campus community. While most of the volunteers don’t have acting experience prior to joining the troupe, they do have a commitment to social justice. During 2012-13, the troupe engaged more than 200 students in various classes, training sessions and student organizations. 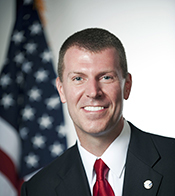 Christopher Meek is tirelessly dedicated to helping American troops and veterans take their next steps forward. SoldierSocks, the nonprofit he co-founded in 2009 with close friend Scott Duffy, focuses on identifying and filling gaps in the traditional systems supporting members of our military. The name of the organization stems from Meek’s first project. Stunned by the fact that our “boots on the ground” in Afghanistan were short of good socks, he sought out donations from communities and businesses, while also creating a nonprofit organization to pursue effective fund-raising for the delivery of donated supplies to the troops. Today, as the chairman of SoldierSocks, Meek is broadening the organization’s mission to helping veterans transition into rewarding civilian careers. The organization has made a monetary commitment to the Maxwell School at SU, as well as to Georgetown University, to fund scholarships for veterans to continue their educations after their military service. Most impressively, Meek and SoldierSocks are helping veterans who have been injured in the line of duty to walk again. His organization has partnered with Ekso Bionics Co., a manufacturer of bionic exoskeleton suits, to raise funds and donate suits to as many paralyzed U.S. veterans as possible. When Mary Gilmore Smith passed away in January at the age of 106, Syracuse University lost one of the oldest, most dedicated members of its extended family. From her days as an English student during the 1920s to decades of counseling and service to others, she was a tireless advocate for women in higher education. Smith began her working career at SU in 1938, when she was named the first vocational counselor for women at SU. While serving as social director and acting dean of women for summer sessions, she was made an honorary member of Eta Pi Upsilon, the nation’s first undergraduate women’s honorary society. Then, as an academic counselor in the Women’s Center at University College, she and colleague Nancy Callahan Gelling started the Eta Pi Scholarship Program, which provides financial assistance to women studying part time at SU. Thanks to her unwavering support of the Eta Pi Upsilon Endowed Scholarship Fund, Smith has the longest giving history of any annual donor at Syracuse University. She also consistently supported the Edward A. Smith and Sheridan Gilmore Smith Memorial Library Fund, named for her husband and son, for the purchase of rare books and manuscripts, and the J. Winifred Hughes Endowed Scholarship Fund. Upon her retirement in 1972, Smith worked for 18 years as director of RSVP for the Volunteer Center in Syracuse. Her many recognitions include the Chancellor’s Citation and Melvin Eggers Senior Alumni Award and the Ollie Owen Award for Outstanding Community Service from RSVP. 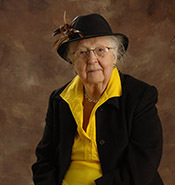 In 2004, she was inducted into the archives of the Women’s Hall of Fame in Seneca Falls.